The Consumer Price Index (CPI) fell 0.1 percent in March, below the expected gain of 0.1 percent, the Bureau of Labor Statistics reported. Lower gas prices at the pump were to blame for the first decline in 10 months. When stripping out volatile food and energy prices, Core CPI was in line with expectations at 0.2 percent. However, Core CPI rose 2.1 percent on an annual basis, a 12-month high. 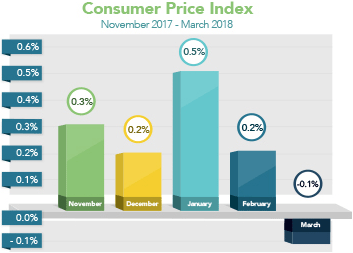 Inflation at the wholesale level was a bit hotter than expected, as the Producer Price Index (PPI) and Core PPI both rose 0.3 percent in March, versus the 0.2 percent expected. Though inflation remained tame in March, the minutes from the Fed’s March meeting showed that the Fed still expects inflation to rise this year. Inflation hurts the value of fixed investments like mortgage bonds, meaning a rise in inflation can cause bonds to worsen. Home loan rates are tied to mortgage bonds, so a rise in inflation can cause rates to rise as well. Geopolitical headlines also garnered attention in the latest week, as heightened tensions over Syria between the U.S. and Russia helped bonds benefit temporarily from safe-haven trading. Earnings season also began, and there is a growing sense that corporate earnings for the first quarter could be strong due to the tax cuts. This could benefit stocks at the expense of mortgage bonds and home loan rates. For now, mortgage bonds are trapped in a sideways trading pattern that began in mid-February. Home loan rates remain just above all-time lows. Retail sales, housing news and manufacturing data highlight the week’s busy economic calendar. Economic data kicks off on Monday with the closely watched Retail Sales report. Also on Monday, look for housing news via the NAHB Housing Market Index. Housing Starts and Building Permits follow on Tuesday. Manufacturing numbers will be delivered Monday via the Empire State Index. Look for the Philadelphia Fed Index Thursday. If you or someone you know has any questions about rates or home loans, please get in touch. I’d be happy to help.